Tampa, FL Air Conditioning & Heating | The A/C Guy of Tampa Bay Inc. In 2009, The A/C Guy of Tampa Bay Inc. founder Gregg Bowman responded to a need for fairly priced, high-quality HVAC services in the Tampa Bay during one of the worst economic climates since the Great Depression. Starting out as just one man working out of his garage and a truck, our company has grown to become a reputable organization within the Tampa, FL community and beyond, known for quality service at great prices. Our vision is to “Serve Our Tampa Bay Family with Integrity and Honor, by Providing Expert Service that Surpasses Their Expectations,” and we live by that in all that we do. You can count on a committed and highly trained staff, including NATE-certified Technicians who treat each client like they are part of our family. We’re proud to serve Pinellas, Pasco, and Hillsborough counties—reach out to our Customer Service Advisors today! Check Your AC Early: Does It Need Repairs? 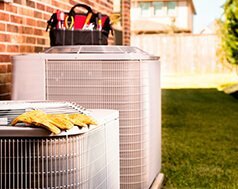 As your air conditioning system begins the job of cooling your house through another summer, take some time to make sure it doesn’t have repair needs.